If you’re having one of those days where you feel like being by yourself why not take a trip to “Point Nemo” also known as the “Pole of inaccessibility”? It’s the most remote location you can possibly get to in the middle of the ocean away from any land. Surprisingly once you get there you are closer to the astronauts at the international space station, around 400 kilometers above the surface of the Earth, than any other humans on Earth. The nearest land, Ducie Island, is located 2688 kilometers to the north of Point Nemo. And since Ducie Island is an uninhabited atoll in the Pitcairn Islands this could be the ultimate getaway that ensures complete and total privacy. 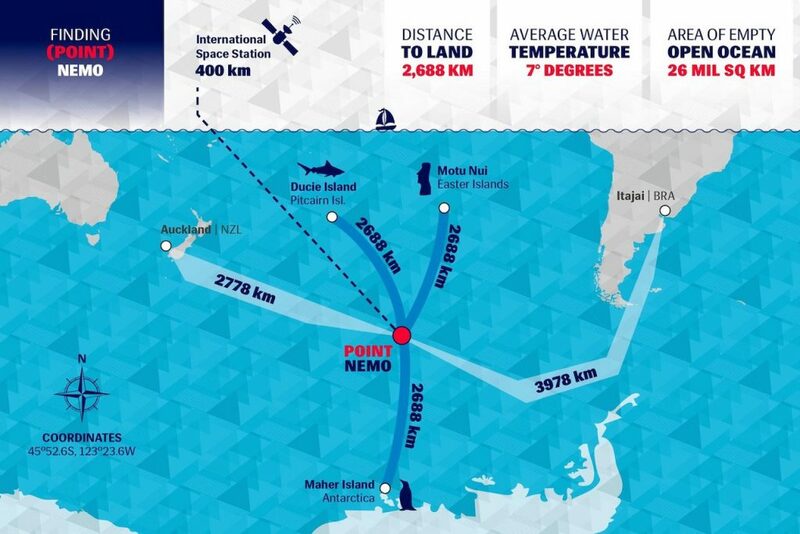 The point was discovered by Hrvoje Lukatela in 1992 and named Nemo in reference to Captain Nemo, a character from Twenty Thousand Leagues under the sea. Nemo means “nobody” in Latin, which makes a fitting name for a place where you’ll find nobody around for miles. Just make sure you take a compass, map and snacks for that long and lonely journey. Previous post Sea cucumbers: Not to be confused with land cucumbers Next post Do you know which marine animal is just as fast as the Cheetah?